How to Dispose of a used Mattress? Ever been driving down the road and seen the dirty nasty mattress lying on the side? Why do people do this? Probably because they are hard to dispose of, costly, no residential trash company will touch them, few dumpster companies will haul them, and just about every landfill or transfer station will not accept them! Some states even have laws preventing them from ending up in a landfills. We have asked several locations why this is and we never get the same answer. The two most common are the springs get caught in the tracks of the equipment and they take up too much space (do not compact). Fabric- Is sometimes already made of recycled material and can be recycled again for mattress or other industries (clothing, insulation). Springs and metal- melted and recycled for numerous applications. Wood- Is recycled in pulp for paper, fuel, mulch, boxes, and much much more. There is not much that can’t be recycled. The company you bought your new mattress through will sometimes dispose of your old one for free or a small fee. Dispose of it yourself. Call your local transfer station or landfill to see if they accept them or if they recycle them. Cost should run anywhere from $5 to $20 per mattress/box spring. Sell it on craigslist, letgo, a Facebook sale site, or any other outlet. Donate it. This probably will take a lot of time, but call around to organizations who might have a need for something like this. Some ideas: Goodwill, Salvation Army, halfway houses, homeless shelters, domestic violence shelters, and thrift/consignment stores. 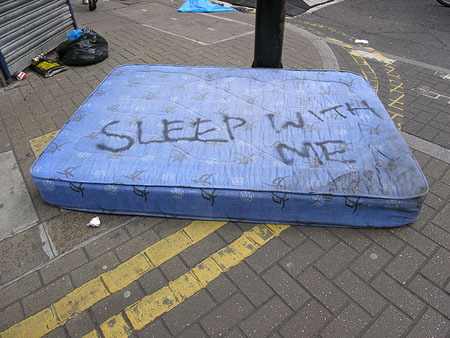 Some states have laws against resale of used mattress. Some areas have companies that deal only will mattress recycling. Try Googling mattress recycle. A majority of junk removal companies will remove and dispose of it (or any other junk). The pros are you don't have to do much physical labor, but the con is that it will cost you approximately $100 to dispose off. Rent a dumpster. If you have a bunch of other debris to dispose of this would be the economical way, but make sure you check first with the company to see if they will take them and if so is there any additional charge. As far as we know Bin There Dump That Dumpsters of Atlanta is the only dumpster company in metro Atlanta that will accept your mattress or box spring; depending on your location. Currently we only charge $15 each with a dumpster rental (subject to change). We can be reached by phone @ 404-692-2838, email Atl@BinThereDumpThat.com or check us out on the web www.AtlantaDumpsterRentals.net.